Today my one of my closest friends is guest posting on the blog. Nancy from Casual Cuisine and I have known each other for about six years. We both love photography and good food. This recipe is a favorite at her house and I asked her to share it here on This Mommy Cooks. I actually made this chicken last week and it was really good. I made it without the wine and with all the seasonings. Make sure to visit her blog! I am all about easy dishes these days. This is just not the season in life for me to be making things that keep me in the kitchen all day and away from my kids. So, you may have noticed I tend to post recipes that are quick and simple, like this one. This dish is so good! It's very simple and easy, yet looks fancier than it really is. This is a super easy, quick dish to make and pop in the oven, and it has a delicious flavor. I try to assemble it while my kids are napping/in rest time so I can just put it in the oven later on. 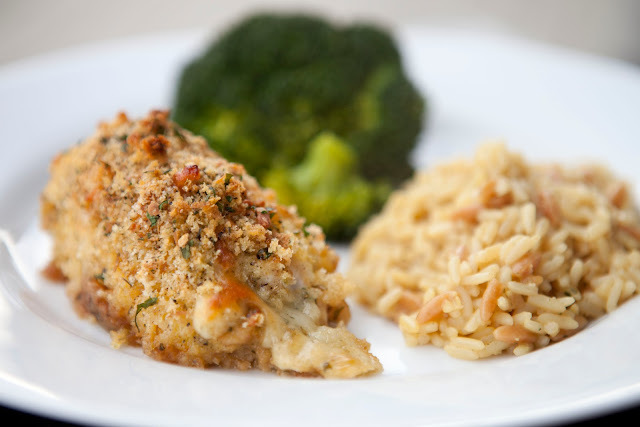 I serve it with rice pilaf and steamed broccoli or salad, and my husband and daughters always love it. Season chicken breasts with salt and pepper and sprinkle mozzarella on top. Roll and secure with toothpick. Make three bowls for dipping: 1) flour; 2) whisked egg; 3)bread crumbs and spices stirred together. Dip rolls in flour, then in egg, then in crumbs (roll to coat). Place in greased casserole dish and top with melted butter. Cook at 350 degrees for 30 minutes. Add wine/broth, cook 30 minutes more.